We talk quite a bit about how to add and shape light to sculpt the look of your subjects in your photos. However, the absence of light is just as important to shaping it as is the presence, and this great video will introduce you to one of the most important tools for reducing light selectively. Coming to you from Jay P. Morgan of The Slanted Lens, this helpful video will introduce you to flags. Flags are an essential tool, particularly when you're working with artificial light. At their core, they're a very simple thing: a piece of material or fabric that blocks light. They're especially helpful when you're using modifiers that throw light all over the set and you want to control the spill. They can also be used as negative fill to bring back contrast. For example, if you want to create a high-contrast look on your subject's face, try putting black flags on both sides of their face to deepen the shadows. You can control the amount of the effect simply by changing the flags' proximity: the closer they are, the deeper the contrast will be. Check out the video above for more helpful tips! 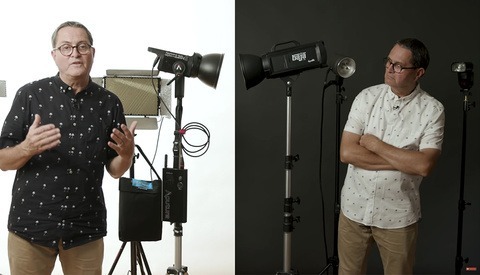 Continuous Lights Versus Strobes: Which Are Right for Your Work? Controlling light is what will differentiate you from a mediocre photographer from a spectacular one. It's not difficult to light someone or something up in without clipping but whether the photo has any mood from the lighting is a totally different story. A lot of photographers make the mistake of thinking about light when composing a photo ("what are you talking about, I thought you just said light control was very important."). Well you should really think of shadow first when composing portraiture, product photography, etc... Slowly building up your composition with shadow. It's the shadows that will give your photo character. Aside from these pointers for J.P. Morgan, I used barn doors, grids, and snoots. They are generally doing the same thing (controlling light), but it does not require as big of a setup. I also recommend cardboard paper. With black cardboard paper you can use them as flags or small v-flats (thicker ones), you can role them up and make them into any size snoot you want (thin sheets), and you can also roll them up and place them on your set to block light. Also cost next to nothing and easy to store. Can this be done in conjunction with other modifiers, such as a softbox ? I see it done where there is a bare light behind a screen but how to do it when the modifier is attached to the light ?